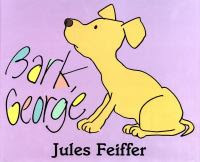 Last week our theme on the Storytime Bus was "Dogs", which is a pretty specific theme to do over and over, but luckily there are quite a few good dog books, and with the popularity of the Paw Patrol television show, dogs are hot with the preschool set. I started off each session with an introduction, letter of the day ("Dd"), and our story song, then read 2-3 books and did 1-2 additional activites. 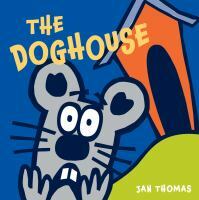 The Doghouse by Jan Thomas was one of my favorite books for this theme. Cow and Pig and Duck and Mouse are playing kickball, but Cow kicks the ball so hard that it goes over their heads and into the doghouse. Yikes! Who will go and get it? One by one they each go into the doghouse, BUT they don't come out! I like to make this one very melodramatic (unless I know I have more sensitive kids in the bunch), and it tickles me to death to see their shocked faces mirror Mouse's when Dog says he is having Duck for dinner! I do love dark humor, but you can always tone it done for the more sensitive ones. 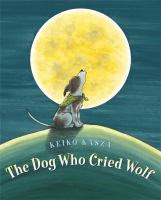 The Dog Who Cried Wolf by Keiko Kasza was another fun one, partly because the audience gets to howl like wolves, which is *almost* as fun as roaring like a lion. Little Moka and his owner Michelle are best friends and life is great, until one day they read a book about wolves, and Moka starts to think his life as a house pet is pathetic in comparison. So he decides to run away and live in the wild like a wolf. But he finds out life in the wild is not so great. The kids are always shocked when Moka runs away, and relieved when he and Michelle are reunited. They don't all get the twist in the ending, but those that do find it quite funny. 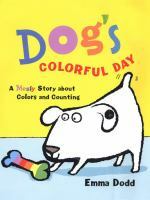 Dog's Colorful Day is a great book that does double duty; not only does it work on colors as the title indicates, it also works on counting from 1 to 10, and has a cute story to go along with the counting. Dog is a white dog, with just one black spot on his left ear. But one day when dog goes out, he gets into all kinds of messes, which stain his white coat, and he returns home with not one, but ten spots of all different colors! At the end when it goes over all the colors of the spots one last time, I like to test the kids and see if they can remember what caused each spot. Widget by Lyn & Jim McFarland is the story of a poor little stray dog in search of a home. He spies a cozy looking house, but when he enters, he finds it is occupied by a very sweet old lady and six cats, who are not big fans of dogs. Widget cleverly starts acting like a cat, and eventually he wins the girls over and he is allowed to stay. One day, there is an accident, and they all learn that while cats are nice, sometimes it is very good to have a dog around. The one I used most was the traditional song "B-I-N-G-O", with a slight twist. After the first verse, we would omit a letter and instead of clapping in its place, we would bark. I had the letters B, I, N, G, & O to put on the magnet board, as well as pictures of dogs to put up in their places. If you're a dog and you know it, sit please! Five were spotted dogs, and five were not. And at dinner time, they ate a lot! I was afraid the theme might be way too specific to work for multiple storytimes on multiples days, but it actually worked really well. I especially had fun with The Doghouse, though I almost lost it a couple of times at the kids' perfectly shocked reactions to Dog having Duck for dinner (no one was upset), though they didn't always completely get the ending and how it was a play on words, they did understand that no one got eaten!